A lot has happened since the first Chain album and all of it was good. Reconstruct opened the door to progrockrecords which opened the door to working with James LaBrie which lead to progrockrecords being aquired by WMD-Holdings. During all this Henning and the guys have been working on EXE and it was a fun ride. They were asked to contribute a track for a SAGA tribute album, which sadly never happened, but now it appears on this album. Weird channels took the song to the guys from SAGA and Michael Sadler expressed interest in doing some guest vocals on it. This session lead to Michael coming back to do even more vocals on the 38 minute epic "Cities" which really kicked this CD to the next level. After Henning mentioned an interest in working with Mike Keneally, the label brought the two together, so Hening wrote a song that would feature his outstanding talent. 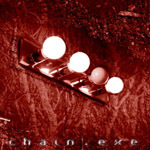 The session with Mike was amazing...you can see some videos of him playing in the video section or on the upcoming Chain.exe "Limited Edition", includes over 120 minutes behind the scenes DVD of the "making of" 'chain.exe'. You'll get to see Mike Keneally, Michael Sadler, Jody Ashworth and all the other guests and members of the band as they worked on the album.